It seems everyone is discovering that all along they were, in fact, married to a narcissist. I’m not sure how that happened, but I will acknowledge I notice a lot of self-centered behaviors in people going through crisis. This is not surprising. If you’re on a ship and it’s going down, you are likely to grab the last life vest even if it means pushing someone else out of the way. And you might justify your decision later with any number of excuses. Once we decide (or it’s been decided for us) that we’re separating from someone we once considered a life-long companion, we tend to retroactively place experiences we’ve had with them into a constellation of behaviors that indicates that we never should have been with them in the first place. We now see more clearly that they are troubled and difficult. I’m not in the business of diagnosing people. I generally assume that people who walk in my office aren’t operating as their highest potential self but that it is in there somewhere. And then I work with them where they are. Along the way, I’ve learned some tricks that help me work with people who are exhibiting narcissistic behaviors. These tricks may also be helpful when dealing with former partners. When someone has been triggered into a reactive state, they simply cannot hear what you’re saying. They will answer your questions and argue, so it appears that they hear you, but they’re stuck in a myopic mindset that doesn’t allow them to take in information that isn’t already part of their mental process. In arguing, you’re not only wasting your breath, you are reinforcing their sense of righteous indignation and causing them to feel even more strongly that they’re right and you are wrong. This is rule #1 for a reason. I’ve been hooked many times by the irrationality of a person’s logic and found myself trying to explain something that seems very simple. I have to remind myself that arguing or trying to convince is a dead end road. 2. Don’t expect them to be different than they are. We are continually surprised - and even outraged - by the inability of people who are exhibiting narcissistic behaviors to empathize with us or see our point of view. The belief that their behaviors constitute a moral failure allows us to feel superior, but also victimized and extremely frustrated. Imagine if your former partner was blind and every day you expected them to have perfect vision. It would be like beating your head against a wall. Instead, assume that they will act in ways that seem insensitive or even outrageous and then you might be pleasantly surprised. According to my interpretation, Buddhists believe suffering is caused by attachment or the inability to accept what is. Once we accept this person is going to behave in a certain way, we can learn how to work with them without getting as angry, sad or judgemental - emotions that stand in the way of our ability to make good decisions. Determine what your primary needs are and keep them front and center. Don’t get distracted by “what is right” or “what is fair”. If your #1 concern is that your children have a stable home, be ready, in the moment, to let go of anything else that you may want or feel entitled to. Remember that you may be able to go back to these issues at a later time when you’ve firmly secured your prize. In mediation, I begin with “the prize”: the goals that both parties want for their children or for their future relationship. These are generally easy. Even narcissists will say they want their children to be healthy and happy. Then we build the parenting agreement from those general concepts toward specifics. When we get stuck, I go back to the agreements - or goals - the parties have made as though I’m returning to the last fork in the road where we may have gone astray. You can do this without a mediator present by calmly returning to what you both want whenever tensions escalate or you reach an impasse in your discussion. It’s tempting to “lay down the law” when we’re in conflict and state what we will no longer tolerate. Providing that information to a person who is exhibiting narcissistic behaviors is like showing them your soft spot. They are likely to go right toward it in (I believe) an unconscious attempt to get you off balance. Instead, keep your line in the sand on the inside so that you maintain your safety. When the other person nears that boundary, steer them away from it without calling it out. Change the subject, find a different reason to end the conversation, or introject humor to change the mood. 6. Don’t expect it to be fair. 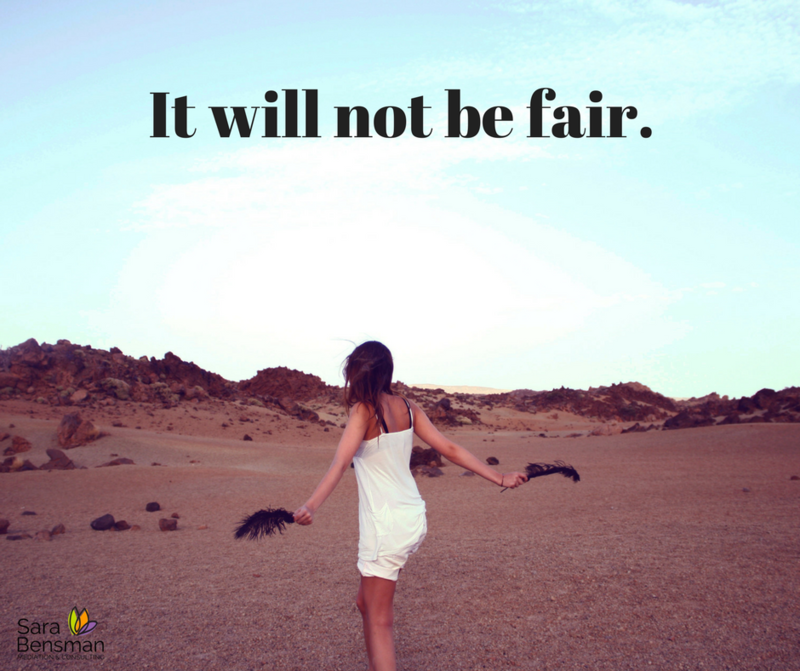 It will not be fair. Even if you are able to negotiate some things that are important to you, you will have had to do this by being silent when you want to speak, by coaxing, coddling, calming, quieting, and pretending that it’s all normal. You will have to be the bigger person. We often consider this a burden, but in fact it is a gift. Mastering the ability to work with people who don’t see the world the way that you see it, to calm your internal reactions, and to still achieve your goals is a triumph that will serve you forever. You will be the person who grows from this experience, even if your former partner undeservedly “wins” something. Do you have more specific questions about how to deal with an ex-partner or space, or would like to talk about your individual story? Set up a free consultation today.